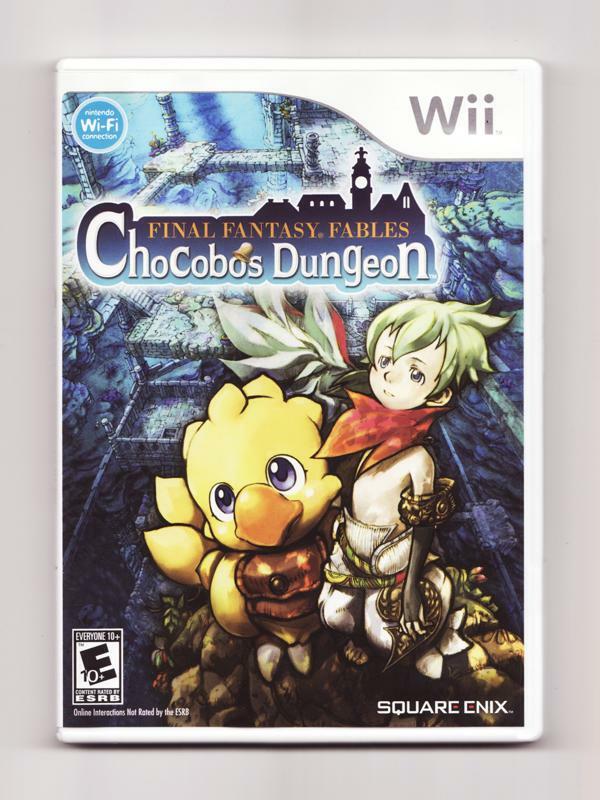 If you've always wanted to get into the roguelike genre but didn't know where to start, Final Fantasy Fables: Chocobo's Dungeon is the game for you. Well, unless you despise things that are cute. If that's the case, you may want to move along to another review. (How about this one? I can't imagine anyone would describe that game as cute.) Anyway, back to why you should play Final Fantasy Fables: Chocobo's Dungeon if you're a roguelike virgin. Well, like I implied in my first sentence, this game is kind of a beginner's roguelike (i.e., dungeon-crawler.) That's not to say it's for babies. 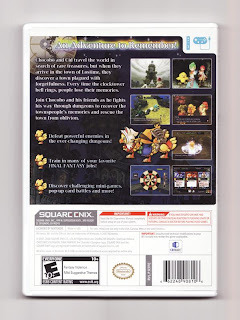 Sure, it looks all cute and cuddly, but play it for a few hours and you're sure to find out that this precious-looking game can and often does pack a serious punch, especially once you start exploring its "special dungeons" (they're special because they tend to limit your level and the items you can bring in with you). Still, it's a lot easier than most examples of the genre, like the Mystery Dungeon games. 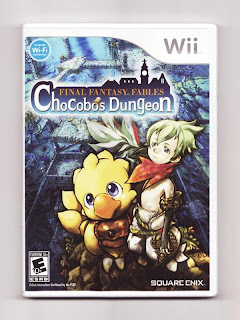 Of course, the roguelike-curious aren't the only folks who should check out Final Fantasy Fables: Chocobo's Dungeon; those who consider themselves fans of the Final Fantasy series in general and of the Chocobo character in particular should do so, too. Other gamers who should give it a go: Those who enjoy appealingly realized graphics (the ones in this title are among the most attractive on the Wii, in my opinion, despite the fact that they barely tax the hardware), those who like fabulously remixed Final Fantasy tunes (all but two or three tracks were taken from previous releases) and those who savor software that contains enough content to keep them busy for many, many hours. Oh, and those who proudly consider themselves cheap--the game can be picked up for less than $25 these days, after all. I haven't gone back to it since a dungeon kicked my squarely in the balls after I screwed up my weapons by fusing them stupidly. Thankfully, I don't think any of that was saved. If you go back to it, here's a piece of advice: Don't worry about fusing stuff early on. At least, I didn't. I don't think I fused anything until pretty late into the game. You should be OK just by trying to find the best claws and armor possible and then honing them to boost their stats. Not sure if that makes sense, but for what it's worth it seemed to work for me! I haven't got a Wii, so obviously I haven't played much of this one (I did rent it and tried a few minutes on my Mom's Wii, though, but couldn't play enough to really get a feel for it), but it's definitely on my radar. Yeah. Well, I'm fairly far along. I think I'm just about to find the third sage...or...whatever they're called. I'm in the memories of that girl who might be the girl from the opening cutscene...the one that steals Timeless Power. Hey there, Anne! Yes, I'd say if the game sounds at all interesting to you, you should give it a try. Just know that this style of game isn't for everyone -- it's kind of archaic, really, even though the developers of this game updated it a bit and made it easier and more enjoyable. As for my Wii being softmodded -- yep! It was very easy to do when I did it (a few years ago) and supposedly its very safe, as long as you follow the instructions on this site -- http://gwht.wikidot.com/ I would read through that site a bit before deciding to do anything, though, as I'm not sure if anything has changed since I softmodded my Wii. Justin: The good news is that I think you can't really screw yourself over too much by honing equipment incorrectly or fusing them incorrectly. In most cases, you can just buy or find new, non-fused, non-honed equipment and start again. Between this review and other people I know talking about it (plus my automatic interest due to cuteness), I'm definitely going to pick this up now! I've experienced the "Mystery Dungeon" types of games before, so the fact that the game can kind of screw you over won't catch me off-guard. In fact, if it's as cute as this, it's much more bearable!